Victoria Falls — Prosecutors have said seven Chinese nationals accused of possessing rhino horn pieces may be charged with money laundering and car theft. The suspects Zeng Dengui (19), Peicon Jang (35), Liu Cheng (23), Yu Xian (25), Yong Zhu (25), Chen Zhiangfu (30) and Qui Jinchang (29 were arrested last week when police raided their rented house in Aerodrome suburb following a tip-off. Detectives found them in possession of over 20kgs of rhino horn pieces worth an estimated $1 million. Their trial was supposed to start Thursday but prosecutor Bhekie Tshabalala told the court that State wanted the case transferred to Hwange. He further revealed that his superiors had requested for deferment of trial to accommodate further charges from police. "When the accused initially appeared, we had indicated that January 3rd was supposed to be trial date and we had to map the way forward whether to transfer the matter to Hwange or continue here because of jurisdiction," said Tshabalala. He added; "The docket has been transferred to Hwange for prosecution to go through it. "They have said they are not yet ready for trial because the police have indicated they want to prefer further charges of money laundering emanating from this case. "There is also mention of a charge of theft of motor vehicle." However, defence lawyer Givemore Muvhiringi said the court cannot speculate that police will bring new charges, adding that trial could not be delayed over that reason. "In terms of Section 69(1) of the Constitution the accused have a right to be tried within a reasonable time," he said. "The docket was ready as police had finished and we agreed on a trial date which is today (last Thursday). The reason for changing position has no ground. "It will be a sad day if court was to buy the story that the state in Vic Falls is different from the state in Hwange or Harare because the office of the state is one. "State is clearly abusing the court if it conducts itself the way it is doing because there is no law that provides that a trial which has been set down can be suspended to allow police to prefer new charges as this brings the question of the sacrosanct right of accused to be presumed innocent until proven guilty." The magistrate Rangarirai Gakanje agreed with the defence and told the prosecution should put its house in order. She said the case would continue on Wednesday this week. The seven were arrested in Aerodrome suburb when police and rangers from ZimParks, armed with a search warrant raided a house and recovered the pieces which were hidden in plastic bags. The rhino horn pieces weighed 20.98kg valued at $938 700. There was also a digital scale in the house, the court heard. Rhinos are one of the world's most endangered species and the Zimbabwe government has quarantined the wild animal from game parks to protected sanctuaries. 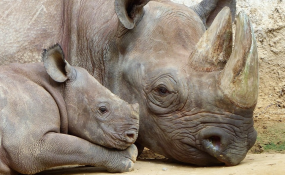 Rhino poaching is common in many wildlife zones, largely driven by the demand for the animal's horn in Asian countries, particularly Vietnam and China where it is used in traditional medicine.